In the face of global change, spatially explicit studies or meta-analyses of published species data are much needed to understand the impact of the changing environment on living organisms, for instance by modeling and mapping species' distributional shifts. A Nature Editorial (2008) recently discussed the need for spatially explicit biological data, stating that the absence or inaccuracy of geographical coordinates associated with every single sample prohibits, or at least jeopardizes, such studies in any research field. In this chapter, we show how geographic techniques such as remote sensing and applications based on geographic information systems (GIS) are the key to document changes in marine benthic macroalgal communities. Our aim is to introduce the evolution and basic principles of GIS and remote sensing to the phycological community and demonstrate their application in studies of marine macroalgae. Next, we review current geographical methods and techniques showing specific advantages and difficulties in spatial seaweed analyses. We conclude by demonstrating a remarkable lack of spatial data in seaweed studies to date and hence suggesting research priorities and new applications to gain more insight into global change-related seaweed issues. The need to share spatial information in a visual framework resulted in the creation of maps as early as many thousands of years ago. For instance, an approximately 6,200-year-old fresco map covering the city and a nearby erupting volcano was found in Catal Hoyuk, Anatolia (Turkey). Dating back even further, the animals, dots, and lines on the Lascaux cave walls (France) are thought to represent animal migration routes and star groups, some 15,000 years ago. Throughout written history, there has been a steady increase in both demand for and quality (i.e., the extent and amount of detail) of maps, concurrent with the ability to travel and observe one's position on earth. Like many aspects in written and graphic history, however, a revolutionary expansion took place with the introduction of (personal) computers. This new technology allowed to store maps (or any graphics) and additional information on certain map features in a digital format using an associated relational database (attribute information). It is important to note that the creation of GIS is not a goal in itself; instead, GIS are tools that facilitate spatial data management and analysis. 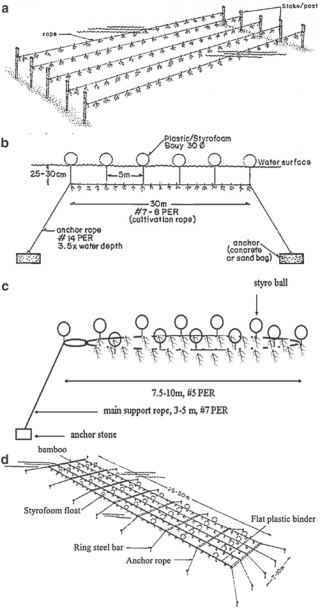 For instance, a Nori farmer may wonder how to quantify the influence of water quality and boat traffic on the yields (the defined goals), and use GIS as tools to create and store maps and (remotely sensed) images, and perform spatial analyses to achieve these goals (Fig. 1). 'This number is based on the search term "geographic information system." The search term 'GIS' yielded 32706 records, but an unknown number of these, including the records prior to 1972, concern other meanings of the same acronym. 2All online database counts and records mentioned throughout this chapter, including ISI Web of Knowledge, OBIS, and Algaebase records, refer to the status on 1 July 2008.
before the first use of GIS in the coastal or marine realm was published (Ader, 1982), and since then only a meager 2,257 have followed. Parallel to the evolution of mapping and GIS, the need to observe objects without being in physical contact with the target, remote sensing has played an important role in spatial information throughout history. In its earliest forms, it might have involved looking from a cliff to gain an overview of migration routes or cities. However, three revolutions have shaped the modern concept of remote sensing. Halfway through the nineteenth century, the development of (balloon) flight and photography allowed one to make permanent images at a higher altitude (with the scale depending on the altitude and zoom lens) and at many more times or places than were previously feasible, making remote sensing a valuable data acquisition technique in mapping. Halfway in the twentieth century, satellites were developed for Earth observation, allowing one to expand ground coverage. At the end of the twentieth century, the ability to digitally record images through the use of (multiple) CCD and CMOS sensors quickly enhanced the abilities to import and edit remote sensing data in GIS. 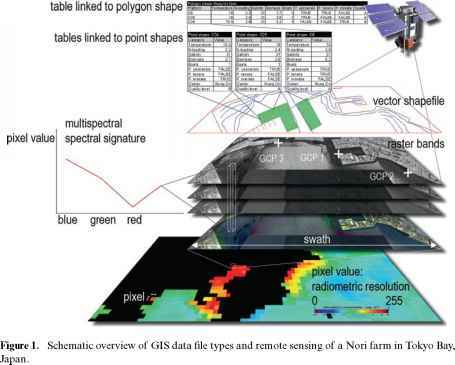 Two kinds of remote sensing have been developed. Active remote sensing involves the emission of signals with known properties, to analyze the reflection and backscatter, with RADAR (RAdio Detecting And Ranging) as the most widespread and best-known application. Passive remote sensing means recording radiation emitted or reflected by distant objects, and most often the reflection of sunlight by objects is investigated. This chapter will only cover passive remote sensing and laser-induced active remote sensing, as sound-based active sensing (RADAR, SONAR) is limited to (3D) geomorphological and topographical studies, rather than distinguishing benthic communities and their relevant oceanographic variables. The first remote sensing applications are almost a decade older than the first GIS publications (Bailey, 1963), and the first coastal or marine use of remote sensing appeared only few years later, starting with oceanographical applications (Polcyn and Sattinger, 1969; Stang, 1969) and followed by mapping efforts (Egan and Hair, 1971). However, out of roughly 98,500 remote sensing records in ISI Web of Knowledge, little less than 8,500 cover coastal or marine topics.